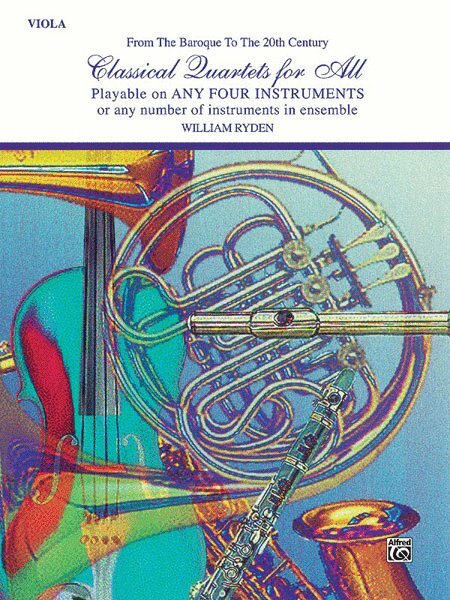 This quartet collection of 13 keyboard, vocal and instrumental pieces covering the Baroque to the 20th Century periods can be played together in harmony by any number or combination of instruments. Woodwinds, brass, strings and percussion can play in like-instrument or mixed instrumentation. It's an all-purpose folio that makes classical music fun! Contains: Calm Sea, Opus 3, No. 2 (Schubert) * Dedication, Opus 14, No. 1 (Franz) * Frolicher Landmann (Schumann) * March (Mozart) * Minuet (Mozart) * Music for Queen Mary (I. March, II. Canzona) (Purcell) * Prayer (Humperdink) * Promenade (Mussorgsky) * Salute (Byrd) * Spanish Dance No. 1 (Granados) * Stoptime Rag (Joplin) * Waltz (Schubert).